Pretty Little Liars meets Final Destination in this YA psychological thriller that will have readers’ hearts racing right till the very end! Kenzie Summerall can’t imagine how she’s been voted onto a list of the hottest girls in school, but when she lands at number five, her average life becomes dazzling. Doors open to the best parties, new friends surround her, the cutest jock in school is after her. This is the power of the list. If you’re on it, your life changes. If you’re on it this year? Your life ends. Who knows better than I do that sometimes there is guilt even when there is no crime? "No one comes into this believing. But after a while... There's no denying that the hand of something very powerful is on this list. Something insidious and unpredictable, something that thrives on the unexpected and never leaves a trace of crime in its wake, only the stink of a curse." There's a very bizarre coincidence. They All Fall Down is quite a page turner! This is a thriller with ominous, fatalistic undertones that also explores themes of death, loss, fear, objectifying women, popularity and high school social structures, and it does it in a clever, not too obvious way. A fun, intense read that is also surprisingly unnerving at times and it keeps you guessing until the very end. Kenzie's junior year promises to be the greatest one yet. She's been voted one of the hottest girls in school! That's right, the geeky Latin-obsessed girl made the famous "Hottie List", the list that makes royalty out of ten junior girls every year. And she is the 5th one! Kenzie knows The List will change her life, but what she does not anticipate is that instead of making it awesome, shiny and fun, her life will whither into a nightmare. Because The List comes with a mysterious curse. One by one, the hottest girls start dying in freak accidents and things quickly spin out of control. In order for the girls to survive they need to keep quiet about the curse and appease the keeper of the list. The problem is no one knows who the keeper is or what it even means to "appease" him. All they know is that they will have to pay a very high price to survive this. As far fetched and highly improbable as the plot line is, They All Fall Down is surprisingly entertaining and hard to put down. Sure, you sometimes roll your eyes at the crazy plot developments and yes, you really have to suspend your disbelief to enjoy this book, but I've read many books that were way more sketchy even without the vaguely supernatural aspect added to the plot. Many of the characters featured in this book are stereotypical and they serve one purpose - to be killed off, adding to the thrill and suspense of it all. And you really don't miss them when they're gone, you don't even feel sorry for them, given that they were deemed superficial, vane, and oftentimes slutty right from the get-go. Ultimately though that doesn't really matter, because it's not a character driven story. I didn't get attached to any of the characters, nor did I particularly sympathized with them, but at the same time I didn't feel like I was supposed to. I just enjoyed the twisty, captivating plot line. I also enjoyed the over saturated, satire-like look at the high school society with all the cliques and popularity-based hierarchies. It was over the top and exaggerated, but undeniably spot on in so many ways. The underlying themes of this book really elevate the story, adding a subtle but very satisfying note to it and making it not only a great thriller, but also a cleverly designed cautionary tale. And they force you to kind of take a step back and re-evaluate your own priorities and behavior. The message isn't right in your face, it does not feel like it's being forced down your throat, it isn't didactic, but it's there and it adds important meaning, and that makes this book even better in my eyes. Overall, They All Fall Down is a book that fans of fatalistic, you-can't-escape-your-destiny stories will probably enjoy immensely, especially if they can keep an open mind and allow themselves to believe in the unnatural, evil forces at play. I had a great time reading this book and will be picking up St.Claire's next novel for sure! 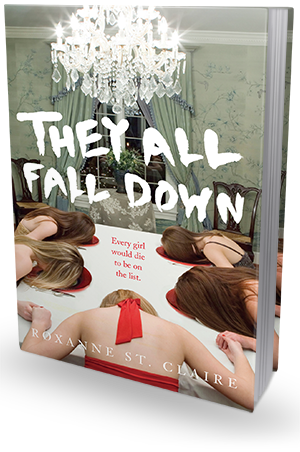 A copy of THEY ALL FALL DOWN will be sent by the awesome publisher to one lucky reader! US only please!